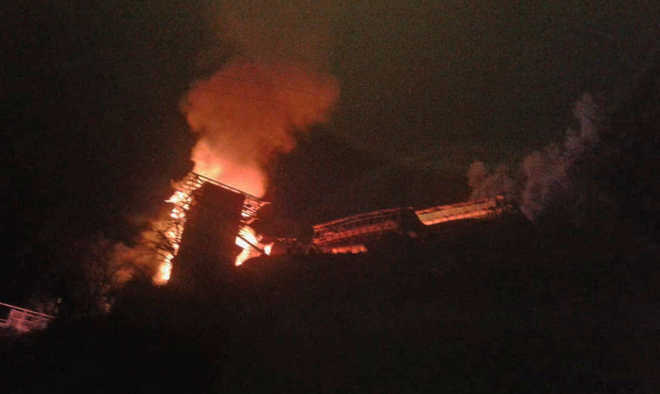 Home India Major fire renders 11 Kullu families homeless..
Major fire renders 11 Kullu families homeless..
A massive fire destroyed three houses and a temple at Barshanghar village in the Sainj valley on Saturday night. The incident rendered 11 families homeless. Eyewitnesses said the fire spread within no time. Most houses are made of wood in the area. Timely action by villagers and the district administration saved around 25 houses from being gutted. Locals brought buckets of water from nearby houses and controlled the fire. Had the villagers not acted in time, it could be a repeat of Kotla incident. The village does not have road connectivity, which made it difficult for fire tenders to reach the spot. Hari Ram Chaudhari, a local, said the people and district administration struggled till 2 am to control the flames. They succeeded in saving the palanquin of deity Sarunag. No loss of life were reported. MR Bhardwaj, Subdivisional Magistrate, Banjar, visited the spot to assess the loss and provided immediate relief to the affected families. Kullu Deputy Commissioner Yunus Khan said Rs 30,000 each was provided to Maghu Ram, Tara Devi, Led Ram, Chuni Lal, Kamala Devi and Lagan Chand, whose houses were reduced to ashes. A sum of Rs 5,000 each was given to five families, whose houses were damaged partially. Apart from this, food and blankets were also given to them. Short-circuit is stated to be the reason behind the fire. The DC said the temple would be re-constructed and the district administration would help the affected families through Red Cross funds. He said efforts would be made to widen the road so that heavy vehicles or fire tenders could pass through it. Major fire renders 11 Kullu families homeless. Previous articleForgiveness is a virtue of the brave, tweets Rahul on Indira Gandhi’s birth anniversary..